The Kanga Insert disposable incontinence pads are designed to be used with the Kanga Pouch pants. The Incontinence pad is inserted in to the pouch inside the pants and is held firmly in place. Once full, the pad is removed and replaced with a fresh one. The Incontinence pads can be used 2 at a time to provide double absorbency. They are highly absorbent and are completely biodegradable. 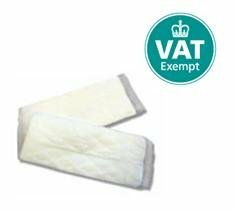 Two pack sizes available Midi (490ml absorbency), pack of 28 pads; Maxi (600ml absorbency) pack of 30 pads.